Welcome to our Time Worksheets hub page. Here you will find links to a wide range of free printable worksheets about Time, which will help your child become more confident telling the time, adding and subtracting time amounts, converting time and solving time word problems. Here is our collection of telling the time worksheets for kids. 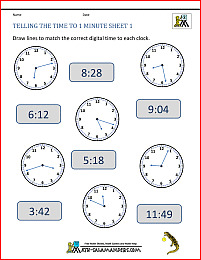 The following worksheets involve children telling the time with an analogue clock, and matching analogue and digital times. Here is our selection of telling the time worksheets for 1st grade. draw clock hands correctly to mark out o'clock and half-past. 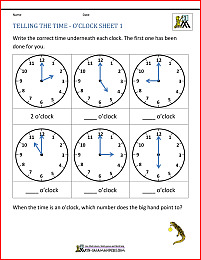 Here are our collection of clock worksheets for 2nd grade. These sheets cover telling the time for quarter past and quarter to times. draw clock hands in the correct place for quarter past and quarter to. 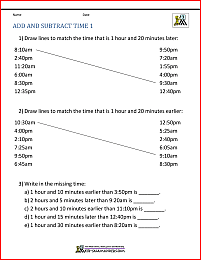 This section contains our 4th grade time worksheets to help children tell the time to the nearest minute. add and subtract time intervals. These 4th grade time worksheets will help your child become more familiar with telling the time. These sheets will help you learn to add and subtract hours and minutes from times as well as working out a range of time intervals. 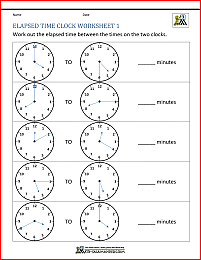 There are also sheets to help you practice adding and subtracting time intervals.